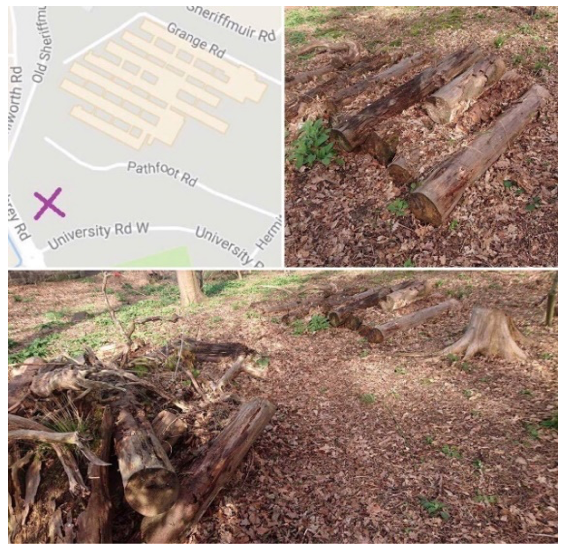 ‘Wild Woods’ was a temporary waymarked geocache designed for primary school children working at second level of the Curriculum for Excellence. The Experiences and Outcomes covered by this geocache are: SCN 2-01a, LIT2-02a, MNU 2-20a and HWB 2-17a. 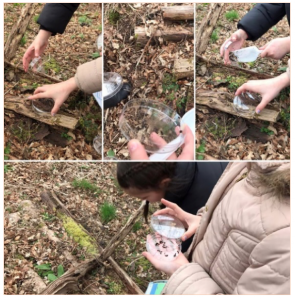 This geocache was designed to stimulate independent learning and active discussion whilst introducing the environmental science concept of biodiversity. The geocache focused on comparing managed and unmanaged woodland. The geocache was placed beside an opening in the university’s west boundary wall which allows access to the Hermitage Woods. From this point both the managed and unmanaged woodlands were observable and accessible which ensured the delivery of the activities found in the geocache were place responsive. This place was an easily accessible location and terrain so ensured full inclusivity of all children. There is a good variety of wildlife at either side of the wall that clearly shows the differences in biodiversity between the Hermitage Woods and the University grounds. 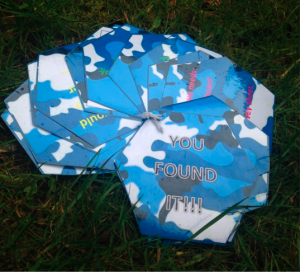 The geocache was a waterproof folder that contained an instruction sheet, activity sheets, whiteboard markers and a whistle. 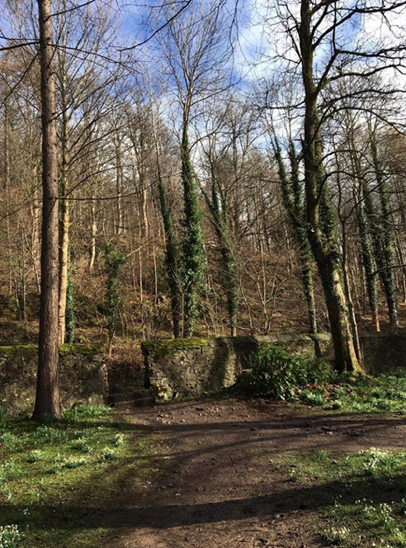 Firstly, the children were encouraged to observe and then discuss the differences between the two sides of the wall and the two different types of woodland. This introduced them to the terminology of managed and unmanaged woodland. Following this the children completed the Wild Woods activi ty sheet. The activity sheet consisted of 9 different things which may or may not be observed at either side of the wall, using location specific photographs as a visual prompt and to cater for all levels of ability. Ten points were allocated for each of the nine things which were observable. The children chose a partner to work with and were then allocated 10 minutes for each side of the wall to complete this task. After completion, the children reconvened, calculated, compared and discussed their totals for side A and side B. They were then introduced to the structural layers of a healthy woodland and how this is important to ensure supporting a greater variety of species. From this the wider of concept of the importance of biodiversity was introduced and discussed. 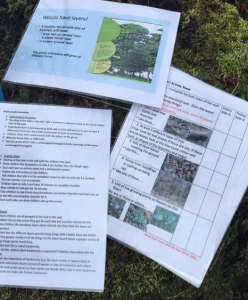 Children then compared the scores from the activity sheet which allowed them to come to their own conclusion about which side had the greater biodiversity. By enhancing their knowledge of woodland management and therefore the environmental impact of human activity on biodiversity, this encouraged the awareness and development of more sustainable lifestyles. discussion, partner work and individual working all within this short activity. The children also developed their observational skills and data handling which are particularly significant skills to have. By Beth Alexander, Amy Smyth . (3rd Yr University of Stirling – Primary Education), Kerry Campbell (3rd Yr Heritage BA). Thanks to Ms Westmoreland and all the pupils from Cowie Primary School who came along to help us trial these. We had a great day with you all. I’m Stumped! How do I estimate the age of a tree? 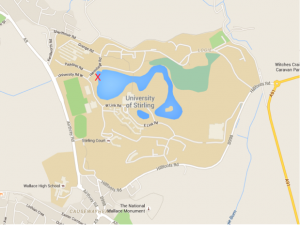 The ‘I’m Stumped!’ geocache was hidden within a wooded area in the far North-West corner of the University of Stirling campus, indicated below. This site was chosen as clear linkages exist between location and planned learning. The scientific concepts being taught were how to use dendrochronology or tree girth to approximate the age of a tree, giving appreciation of how long a tree you are looking at took to grow. Planned extensions to this idea discussed factors influencing tree growth, and trees as a valuable resource. Links were made between trees and climate change. 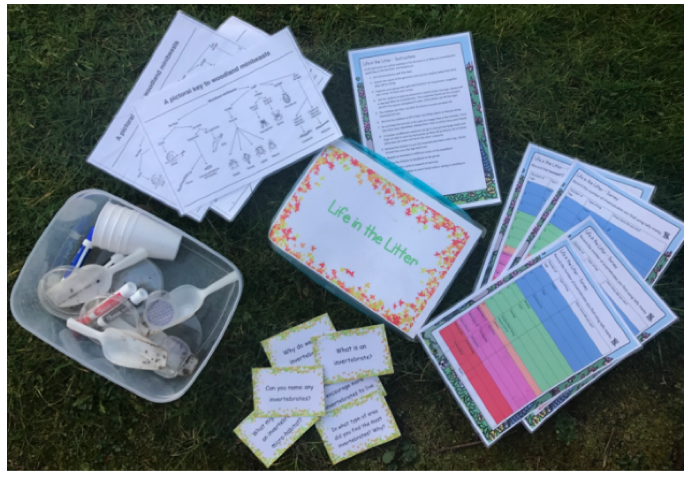 Using an enquiry based approach, the geocache concluded with discussions about how the children and their families could make changes in their lives to help protect the ozone layer and limit climate change. 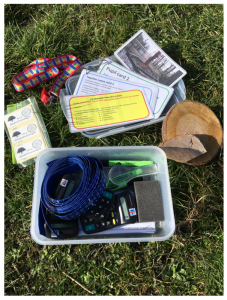 The cache contained questions and activities for the pupils, supported by teacher notes. The box held resources for completion of collaborative tasks and discussions. Differentiated tasks were included in the teacher notes. Photographs were taken to provide prompts for pupils to recall and develop their learning back at school. Upon finding the cache pupils were encouraged to step back and allow others to discover it for themselves. The cache was opened once everyone had located it. 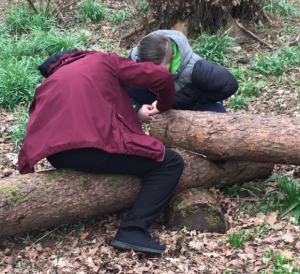 Pupils examined tree stumps of their choice and were supported to count the tree rings as a representation of approximate years of growth. Children were asked to consider how to estimate the age of a standing tree. Links were made to the buildup of tree rings and the girth of the tree. 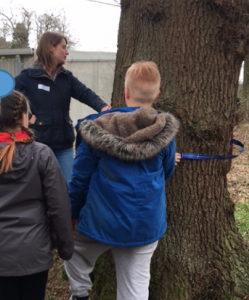 A teacher worked with pupils to demonstrate how to measure the circumference of the tree trunk. 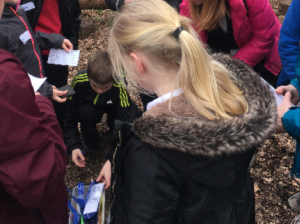 Pupils then worked in pairs independently, within set boundaries in the woodland, and used their measurements to estimate the age of trees. The group then assembled to discuss their findings. Teachers then asked the group why tree rings might differ in width. Through discussing what a tree needed to grow, the children realized how climate can influence tree growth, and they make connections to the hole in the ozone layer and global warming. The group was led into a discussion about sustainability, then encouraged to consider how they might live in a more sustainable way. ‘Life in the Litter’ was a temporarily waymarked geocache located in a woodland, close to the Stirling University entrance. The aim of our geocache was to facilitate the teaching and improve the learners understanding of the scientific concepts of biodiversity and habitat. 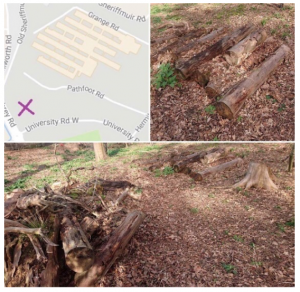 The area was covered in leaf litter and as a result of recent tree cutting; there was an abundance of log piles. 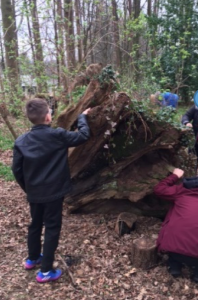 This was therefore, an appropriate place-responsive location as our cache was hidden within a log pile that would be home to a variety of invertebrates and the children could see a real-life example of how invertebrates can be conserved and encouraged to live in a particular location. The aspect of science that our geocache aimed to explore was biodiversity and habitat. The cache sought to provide an opportunity for the learners to actively engage with this scientific concept through an invertebrate survey. 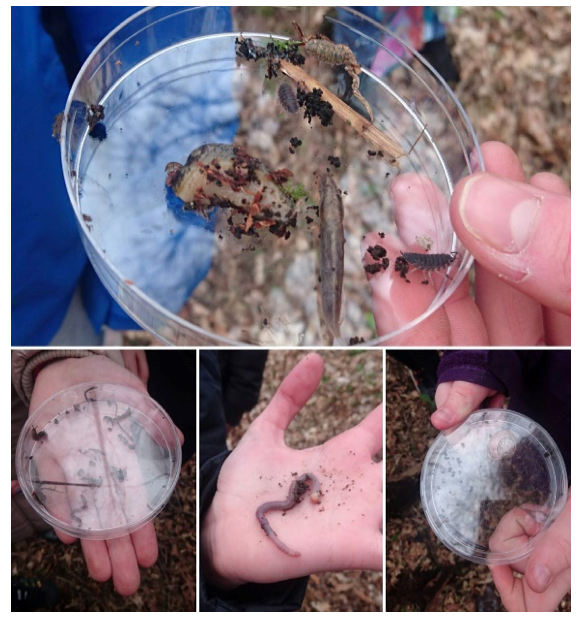 The children used a branched key to identify and classify the invertebrates discovered in the leaf litter and log piles, before recording their findings in a survey. These experiential learning opportunities ensured that there was a high-level of engagement, motivation and challenge within the task. The nature of the geocache activity allowed the children to increase their depth of knowledge in the scientific concepts. This was achieved by allowing the learners to explore the issues of biodiversity and habitat for themselves, which enabled them to reach higher levels of knowledge and understanding. The main link of this learning to the Curriculum for Excellence experiences and outcomes is to SCN 2-01a: I can identify and classify examples of living things, past and present, to help me appreciate their diversity. The activity also ties in with the new benchmarks for science through the use of branched keys, classification and habitat rationale. The final aspect of this geocache addressed ‘Learning for Sustainability’. The children were asked the question ‘Why do we need invertebrates?’ This began a discussion that purposefully encouraged learners to consider the importance of invertebrates and the benefits they provide us with. The children were then asked ‘How could you encourage more invertebrates to live in your local area’, which combined with the geocache location, facilitated a conversation about ways they could conserve invertebrate species and promote their numbers in their local area, whether that be at home or in their school grounds, e.g. bug hotels, log piles. The sustainable aspect of this geocache is one that could be further explored in future outdoor lessons or back in the classroom to help the children achieve the experience and outcome SCN 2-02a in Curriculum for Excellence (Scotland): I have contributed to the design or conservation of a wildlife area, as the learners could design and build their own habitats to increase the invertebrate population of their local environment. Additionally, the geocache offered a variety of interdisciplinary opportunities, for example the incorporation of a survey allowed the children’s numeracy skills to be developed and the sustainability discussions that arose allowed for exploration within the social studies curriculum. 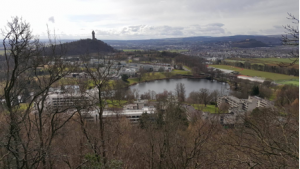 Our geocache* is situated in the Hermitage Woods behind the University of Stirling, at a spectacular viewpoint of Stirling Castle and the Gargunnock Hills. Scientific knowledge is developed and applied at a local landmark and its surrounding area, taking advantage of the unique geological features of the site. 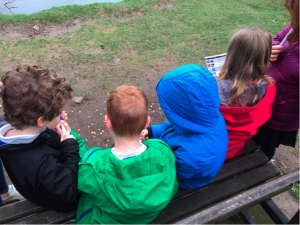 The cache aims to give pupils an idea of how the landscape they look out onto was formed through glaciation, discussing scientific ideas such as glacier formation, rock erosion, and states of water. Questions within the cache aim to develop scientific knowledge in these areas, and questions are set up so that knowledge gained from discussing one question/activity can be applied to solving the next. Teacher notes and relevant fact sheets are included within the cache in order to facilitate easy access to learning from first level through to fourth (a handful of which have been provided at the end of the blog). 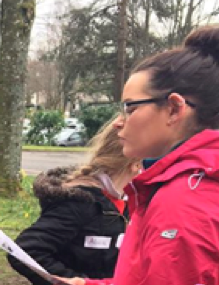 Cache activities conclude with pupils considering how raising temperatures would affect global sea levels, after learning about how glaciers form and melt with global temperature changes. Extra thinking points are provided, including what might cause temperatures to rise, and what could be done to minimize rises. These aspects allow links to be made to sustainability through climate change, but are introductory points which can be further developed and researched in class alongside appropriate topics with curricular experiences and outcomes such as renewable energy and energy sources. Learning can also be made more contextual and relevant to pupils at a local level through optional extended activities in which they evaluate how rising sea levels caused by climate change would impact their local area, using web resources provided in the cache activity sheet. The cache is place-sensitive, using the viewpoint to allow pupils to look over the landscape through binoculars and better visualize how the glacier over the area would have changed over time. Pictures in the cache arranged in a storyboard further aid this. 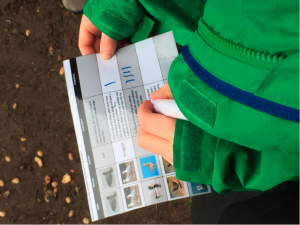 Maps of the area are also provided and when completing activities, pupils use the maps to look out onto the landscape, identify features on the maps that they can see, and determine how erosion and sea level rise would affect them, making place-sensitive links. Rock samples from the high and low ground pupils observe are provided within the cache, allowing them to query and investigate why such differences in the height of the landscape exist. Working together, they must apply their scientific knowledge to determine which of the rocks is stronger, and how the glacier event would have effected them, leaving the landscape which we see today. 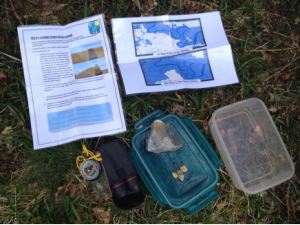 On finding the cache, pupils opened it to find an explorer task sheet with accompanying pictures, as well as two rock samples with binoculars and a compass. They were able to use the compass and binoculars to identify Stirling Castle, the surrounding Hills and the farmland below thus contrasting the high and low ground. Pictures in the cache and prompting by the adults through the use of the teacher notes when required aids the visualisation of a large glacier covering the landscape. Pupils wondered why a once flat and ice-covered landscape was now low ground with starkly contrasting steep hills left behind. This was answered using samples of rock in the cache, taken from the high and low ground spots pupils observed. By rubbing the rocks, they were able to identify that one was crumbly whilst the other was tough. They then applied their learning by suggesting the glacier caused the weaker rock to erode, whilst the tougher rock stood strong, leading to the mixture of steep hills and lower ground left today. Following this, we explored how the glacier would disappear, what would happen to the moisture, and where it would travel. Using ideas like picturing ice dropping into a bathtub, and the effect it would have on water levels, they were able to determine that the ice would melt and lead to sea level rises. Pupils then looked at maps with the viewed points highlighted, and how different sea level rises would affect them, effectively turning the castle rock and hilltops into an archipelago. The maps contained within the cache clearly mark which areas from the viewpoint would be underwater and which would not. This all came together and linked to the global issue of climate change by posing the question ‘What would happen to areas covered in glaciers today if temperatures rose’, and ‘Which areas would be most affected’ bearing in mind what we had done today. Pupils were able to determine that sea levels would rise due to melting of glaciers if temperatures rose, and that low elevation areas would be in the most danger (as shown by the maps and viewpoints). Thinking points were shared which they could then take back to class, including ‘what might cause temperatures to rise’ (with prompts such as how we get our power and energy) and ‘what can we do to help?’ Broad aspects like this can be researched and developed in class if pupils show further interest in the topic. Authors: Jonathan Scotland and Daniel Martin – 3rd Yr Primary Education Students – Environment specialism. 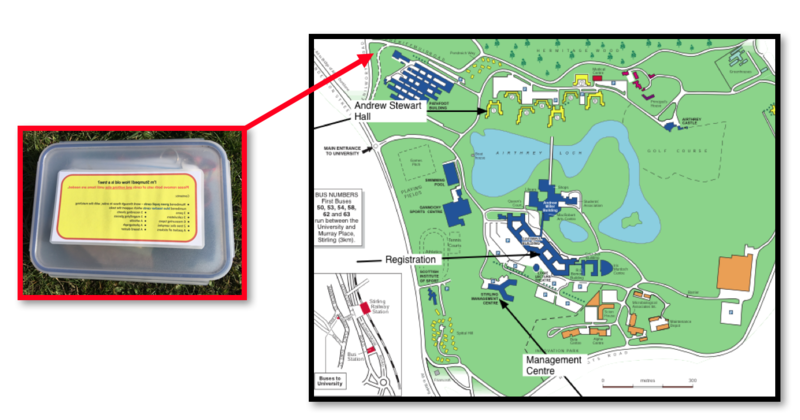 The ‘Go-With-The-Flow’ geocache (a temporary ‘waymarked’ geocache) was hidden just off the path near the popular and accessible water bird feeding spot at the water’s edge on the University of Stirling campus. X marks the spot! The geocache is place responsive as it is specific to the species of Airthrey Loch, and their interactions. The place responsiveness along with key links to learning for sustainability and inquiry based science create an effective time leveraged geocache where all three aspects are at play at the same time. Firstly, try to find the box of goodies…GOOD LUCK!!! Hint… it ain’t on the loch side of the path. On opening the box you will find an instruction booklet – a step by step guide for completing the tasks – as pictured below. The first task invites you to stand by the bench and carry out a water bird survey overlooking Airthrey Loch. Take a tally of each species of water birds you can see (the challenge is to make sure each bird is counted only once!). You may even spot some species we’ve missed, so add them in too! The second task is centred around the scientific concept of food webs; yes, these are about more than just spiders! The participants are to work as a team using the species cards to create one food web of the species they have just surveyed. 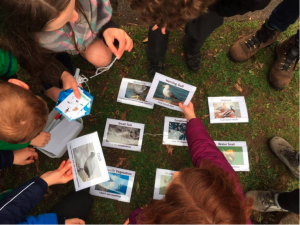 Placing the species cards on the ground and connecting them with string according to what they eat. The key idea is to help generate or progress understanding of energy flow between species. Try and figure out which way the energy flows! Lets finish off the activities with a few questions, get those thinking caps on. 1) What would happen to the water birds if people were to stop feeding them? 2) What would happen if a plankton killing virus was to infect the loch? 3) How would this effect the food chain? 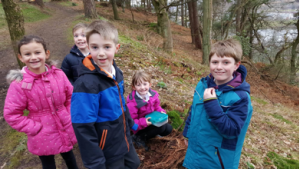 The #GoWithTheFlow geocache was designed with Primary 4 pupils in mind, however, it can be enjoyed by all from cradle to grave. Helps pupils understand the links between their world and the wider world. Helps pupils understand that most animals’ food energy can be traced back to plants and that the sun is the ultimate source of energy needed for the growth, reproduction and survival of most organisms. I am aware of different types of energy around me and can show their importance to everyday life and my survival. When I engage with others, I know when and how to listen, when to talk, how much to say, when to ask questions and how to respond with respect. * The temporary way marked geocache site is not listed on geocaching.com These caches are only very temporary and will not be maintained. "Children are far more enthusiastic to learn about science when gadgets are involved"
"It teaches children to leave things as they find them and to share responsibly"
"I have gained confidence in using technology as part of teaching outdoors"
"Even children as young as four can operate a GPS successfully and find a geocache"